SSTI version 2.0 – the great update! 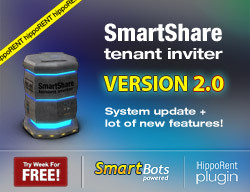 The new version of SmartShare Tenant Inviter (SSTI) has been released – v2.00! Your bot will send IMs to tenants who are expiring or already expired! New Hippo plugin works better, faster and more reliable. Box tenant change is now supported. You can easily replace (edit) the Hippo box tenant now using a native Hippo box menu. We’ve made the web interface more informative (especially the history and search pages). Updating 500+ Hippo boxes to a new SSTI version is usually a problem… not with v2.00+! SmartShare Tenant Inviter (the group and tenants management tool) has been updated. Previously, only one SSTI server was allowed to be installed on the sim (since SSTI boxes automatically fetch configuration from the main server). Now you can install as much SSTI servers as you need. This can be done by specifying the “CLOUD” option which assigns SSTI server to another cloud rather than a default one. The update is backward compatible, thus you can leave you existing SSTI infrastructure untouched, and just add new SSTI server within a different cloud. The SSTI box is available for free at SL Marketplace. This blog entry consists of two parts: the notification about new functionality (related to group moderators and SSTI) and announcement of the bot scripting language. Group Moderators are now able to manage the SmartShare Tenant Inviter (SSTI) web interface. (Those who don’t know about SSTI please visit SL Marketplace page of this product). Assigning SSTI group moderators is easy: login to SmartBots account and click “Group Moderators” at the left menu. You can add a new moderator to manage your SSTI web interface, or give this ability to the existing moderator. 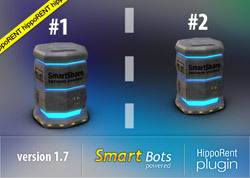 People who use SmartBots personal bots love gaining more and more control over their bot’s behavior. We’ve received three interesting requests during the last week (one came from the roleplay sim owner, and two related to the group chat and modelling bots). 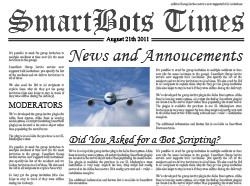 After discussing these requests we decided to start developing the bot scripting language – codename SBSL. The bot’s script will instruct your bot how to react on various events (group and local chat messages, people coming by, inventory offers etc). If you would like to request anything else to be added, please contact us. We are glad to hear all your wishes!